Summary: Lily hasn't always had it easy, but that's never stopped her from working hard for the life she wants. She's come a long way from the small town in Maine where she grew up - she graduated from college, moved to Boston, and started her own business. So when she feels a spark with a gorgeous neurosurgeon named Ryle Kincaid, everything in Lily's life suddenly seems almost too good to be true. Ryle is assertive, stubborn, and maybe even a little arrogant. He's also sensitive, brilliant, and has a total soft spot for Lily, but Ryle's complete aversion to relationships is disturbing. As questions about her new relationship overwhelm her, so do thoughts of Atlas Corrigan - her first love and a link to the past she left behind. He was her kindred spirit, her protector. When Atlas suddenly reappears, everything Lily has built with Ryle is threatened. 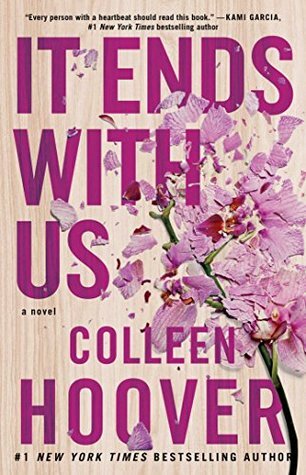 I'm a huge Colleen Hoover fan, but I hadn't had a lot of reading time in college and therefore didn't get my hands on this book as soon as it came out, which I should have. Emily did, however, (and her review is linked at the bottom of this post), and she recently encouraged me to buy it and read it before BookCon (since Colleen Hoover herself is going to be there!!!!! ), so I did. And let me just tell you guys, Colleen has done it again. I haven't really disliked any books of hers as far as I can remember, and this one was no different. As the summary explains, this is the story of a girl named Lily, who grew up in an abusive household. Once she finally managed to escape it and she found a man and fell in love, he has random outbursts that remind her of her childhood, but they're far less frequent than her father's were, and she finds herself forgiving him again and again. On top of that, a lot of things come up about her first love, and that isn't making her life any easier. Overall, I really enjoyed this book. It gave you a good insight into domestic abuse from both a person who has witnessed it during her childhood and experienced it in her adult life. Before reading this book, I will sadly admit that I used to not understand why people in abusive relationships ever stayed in them -- I always said that the minute my significant other laid a hand on me, that would be the end of it and I would disappear. I was young and dumb and figured it was that simple. This book shows you that it isn't that simple. And this book is even based off of some of the author's own life experiences, which I didn't know until the end when I was reading the author's note and acknowledgements, which opened my eyes to the subject of domestic abuse even more. Colleen Hoover isn't just creating a character who witnessed these terrible things happen in her life. She herself has seen some of them. I also really enjoyed Lily as a character. She was strong and independent, and she spoke her mind pretty frequently (hence her and Ryle's "naked truths"). Throughout the book, she may have some weaknesses from time to time but overall she shows strength and determination that I valued and admired. So it's safe to say that by the time I got to the end of this book, my mind was opened up and I realized that domestic abuse situations, while still unhealthy and definitely something that every person needs to get themselves out of, it's necessarily a "one and done" situation where it's that simple to get up and walk away. Also, time passed in weird intervals in this book. Sometimes entire months would pass in between chapters, and sometimes just days or hours would. And when these significant stretches of time passed, all the reader got was a brief brush-up on the scenario, but some of these scenes that we missed were either really sweet or important, so it sucked just a little bit that we didn't get to read the entire scenario ourselves. Overall, I really enjoyed It Ends With Us. Even if it wasn't perfect, Colleen Hoover did it again with another book that makes you laugh, gasp, cry, and swoon at all of the perfect moments. If you were on the fence about this book because you hears about it's about domestic abuse, I still recommend picking it up and giving it a try. It's especially important if you're not a victim of abuse, because it opens your eyes and helps you to see what the situation is like from the eyes of the victim, and most importantly, it shows you how and why it isn't always that easy to walk away. I really enjoyed reading this book, and it managed to change my perception on a topic that I didn't know much about previously, so I definitely think that it served its purpose. Top Ten Tuesday: Summer Reads Edition! Top Ten Tuesday: Books To Buy Your Mom! The College Diaries: Finally Home For The Summer!